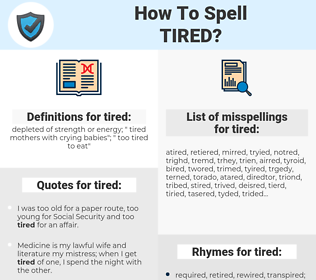 What are the misspellings for tired? What are the common mistypes for tired? What is the definition of tired? What does the abbreviation tired mean? What are the quotes for tired? What are the rhymes for tired? What are the translations for tired? 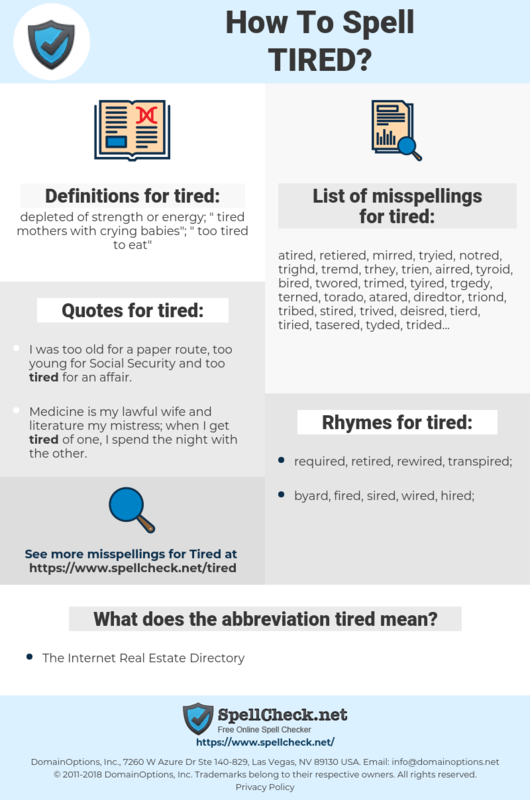 What are the common typos for tired? depleted of strength or energy; "tired mothers with crying babies"; "too tired to eat"
This graph shows how "tired" have occurred between 1800 and 2008 in a corpus of English books. I'm tired of the industry, tired of playing the whole game- the dressing up, the red carpet. I hate talking about myself. 倦, 疲倦, 乏, 困, 困倦, 苶, 癯, 疲匮, 骀, 累了的. geschafft, müde, ermüdet, ermattet, ausgelaugt, strapaziert, unausgeschlafen, Lasso. farto, esgotado, exaurido, ultrapassado, exausto, desinteressante, pesada, fatigadas, exaustos, estafado, exausta, enjoado, enfastiado, derreado, esfalfado. gasto, agotado, aborrecido, enfadado, batido, harto, cansado, fatigado, extenuado, cascado, manido.